Apply online application to Rajasthan RSMSSB Recruitment 2018 2512 Supervisor, Live Stock Assistant, and TAX Assistant. 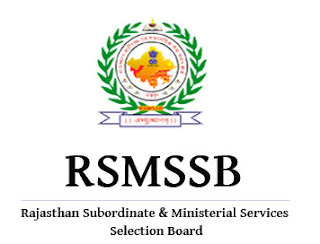 Rajasthan Subordinate and Ministerial Service Selection Board (RSMSSB) Recruitment Board, latest notification for Supervisor, Live Stock Assistant, and TAX Assistant. Applicants can get full advertisement below and submit the RSMSSB online application at www.rsmssb.rajasthan.gov.in. Applicants who are going to apply, ensure that you are eligible for post of Supervisor, Live Stock Assistant, and TAX Assistant. The applicants will have to apply Online Form 2018, no other option. The last date of submitting online application is 22.03.2018. RSMSSB notification further information such as eligibility criteria, syllabus and how to apply etc. listed below. 1. Bachelor Degree in Any Stream Science / Arts / Commerce / Engineering in Any Recognized University in India. 4. Bachelor Degree in Science with Chemistry as a Subject. 1. Bachelor Degree in Any Stream with Science / Arts / Commerce or Equivalent Stream in Any Recognized University in India. How to apply: Eligible applicant require to apply online through Rajasthan RSMSSB Recruitment 2018 website www.rsmssb.rajasthan.gov.in from 22.03.2018. 1. Log on to the Rajasthan Subordinate and Ministerial Service Selection Board (RSMSSB) website www.rsmssb.rajasthan.gov.in. 6. Make the payment by Cash at Rajasthan Government Authorized Emitra or Pay through Debit Card, Credit Card, Net Banking, Mobile Wallet and More. Applicants have great chance to get jobs Rajasthan Subordinate and Ministerial Service Selection Board (RSMSSB) Recruitment, however if someone want to ask anything please comment below.